Ce n’est pas le meme chose, necessarily. Perhaps the same conclusion, but not the same thought process per se. It has been proven (though it was obvious to most) that life indeed begins at conception. A life begins at that moment. The question is not whether human life begins at this point; the question is whether it being human life is enough justification for its protection. Is it a person because of its biological makeup as human? Or is it a person because it has achieved a certain level of “awareness”, “self-consciousness”, or “viability”? These aren’t questions of scientific pursuit. These are philosophical questions. I take the former tack. As to tendency, sure. Presuppositions and whatnot, of course. But to attack the presuppositions of one group while claiming that one does not ALSO have presuppositions is where I take issue. This whole thread is a field lab for liberal avoidance. When confronted with inconvenient facts or uncomfortable questions, change the subject. You attacked this posting for being unfair in noticing that a journalist was being unfair with his interpretation of scientific results… an interpretation you later characterized as unfair yourself, thereby agreeing with the posting. Why are you even arguing any more? To impress us with your ability to google for links to easily debunked crap, and then call us names when we debunk it? “Answer this simple question: Why can we apply these correlations to conservatives, but not to liberals? If we apply them to liberals, we can say liberals are pedohpiles. This is obviously stupid, so why is it stupid for me to do it, but not stupid for you to do it. Oh, but Mooney does apply correlation to liberals….correlations that involve increased grey matter in the ACC, which conservatives do not have. I don’t understand how increased grey matter in the ACC correlates with pedophilia. pedophilia. Again, I have to say Mooney’s model appears to be empirically accurate. Conservatives are irrational on climate change, ensoulment, ToE and birtherism. Its exactly what he predicts. Thanks for playing… better luck next time! Pedophilia is not correlated with increased gray matter volume in the ACC. It is correlated with a decreased gray matter volume in the amygdala. 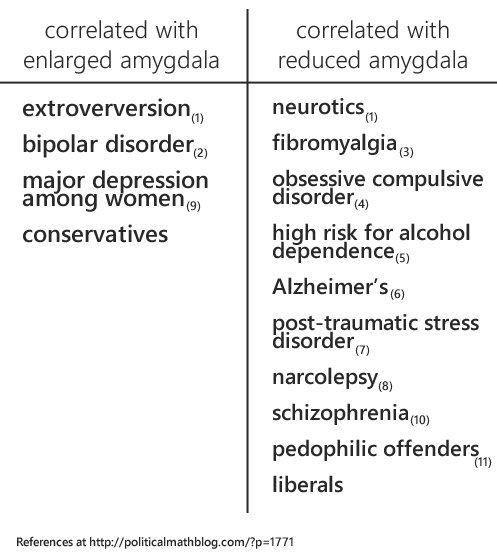 Liberals have a decreased gray matter volume in the amygdala relative to conservatives, just as pedophiles have a decreased gray matter volume in the amygdala relative to normal people. Gray matter volume can be a structural indicator of functional/behavioral differences between groups. However, we cannot say that increased gray matter volume means X and decreased gray matter volume means Y, because that’s not how it works. While the amygdala is involved in fear and anxiety control, that doesn’t mean that one can use an increase or decrease gray matter volume to determine how someone sees the world. Holland treats conservatives as lesser beings, cowering and frightened and yet eager to be consumed by fear based on their media consumption and political support. Holland tries to explain conservatives like they are a different species and not a different approach to problems. The behavioral, functional differences exist and they do have a structural correlation, but Holland can’t defend his characterizations. Well then little missy, you may know something about the “science” of -the evolution of culture- but for you to comment about conservative irrationality for denying anthropogenic global warming is laughable. How would you suppose a reasonable socialogist would determine the rationality for a sociologist to comment about global warming? Paleoclimatology must have been a pet project for the sociology dorkpartment there at UC berkeley. A real scientist understands that you cannot necessarily draw a straight correlation line between two data points in space, to the exclusion of all other potential data points (discovered and yet undiscovered). They may be completely unrelated. They may be co-related. They may be dependent. They may be causative. THEY MAY HAVE NOTHING IN COMMON AT ALL. The point is you just don’t know unless you have examined the relationship to ALL OTHER DATA POINTS!!! And when I say all other data points, I mean ALL other data points. That is the entire point to the article. That without ALL of the data it is ludicrous to surmise correlation (and scientific malfeasance). That is why I must agree with the much earlier posting lamenting the future of “science” in the hands of moronic pseudo-science self-important progressivist propagandist anti-societal marxists…ahem, liberal people like yourself. Conservatism represents a mind set that publicly rejects science as somehow insufficiently strict of method, while seeking relief from the scruntinty of science by simultaneously invoking both the verities of faith and the ambiguities of science as defenses. It seems pretty clear that a new field of inquiry is opening up here but the conservative picture of the world was doomed anyway if it ever expected to escape both the clarifying power of science and profund complexity of nature with an argument as shaky as the tattered legacy of patriarchy. There’s more than enough scientific reasoning proffered today to understand that the totality of who we are – from our most basic instincts and emotions to our most complex thoughts and beliefs – is completely LEARNED! That is to say, whatever inchoate energy it is animating this mass of blood and bones we call ourselves, there is no indication that our personalities, identities, or any other facet of our metaphysical being is static, defined, or pre-determined in any way! There is however, every indication that the same cognitive template we learn through, and can identify, once verbal skills are acquired, exists from the time of conception on a rudimentary, non-verbal basis as well. Thus, everything we come to “know” about ourselves and our world, is determined, in ever-evolving cognitive capacity (non-verbal, then verbal), from what we LEARN. Just realizing the learned nature of who we are and what we “know”, allows us, paradoxically, to debunk many of the very beliefs, identities, and worldviews we’d heretofore presumed as innately our own – and inexorably been living our lives by. And finally, the fact that we’re all animated by the same undefined energy – learning any differences we may have amongst each other – confers scientific validation to the age-old moral concept of all people being created equal. It instantly evolves the entire paradigm of ones thinking, and confers scientific validation, as well as moral imperative, to what here-to-fore had been presumed. Understanding the learned nature of who we are and what we believe should be as common to the zeitgeist of future generations as a curved Earth is to our own! Defying the initial description (“nightmarish landscape”), I have always been amazed at (with few exceptions such as Bill Clinton and Joe Biden) how “unhappy” liberals look in general with many appearing “tortured”. Having trouble with their own “devils” methinks.